Capt. Willcox recounts his environmental adventures at sea in this folksy memoir. Though most adventure stories show the protagonist experiencing a transformation, Willcox remains the same from beginning to end. Adopted early in his life, the author grew up in a radical household, and his parents butted heads with such figures as Sen. Joseph McCarthy. Throughout his early years, Willcox dedicated himself to progressive causes and maritime activities, particularly sailboat racing. 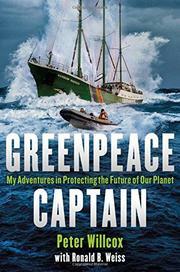 After 30 years captaining ships for Greenpeace and battling abusive corporations around the world, the author seems unwavering in his devotion to the planet. Instead of a textured character study, the author rattles off one seafaring tale after another. “I found myself in Peru, walking around on a dead baby whale with a tape measure in my hand,” begins a typical chapter. The prose is a hodgepodge of anecdotes, journal entries, documents, maps, and footnotes, and it is clear that co-author Weiss struggled to wrangle these meandering tales into a coherent book. But unlike the stereotype of the angry and single-minded activist, Willcox seems earnest and good-humored. After sailing more than 400,000 miles of ocean, the author could begin and end his book anywhere, yet he chooses a strong denouement: arrested by Russian authorities, Willcox and his crew were incarcerated for two harrowing months. Conditions in the prison were medieval, and he had no idea whether Vladimir Putin would grant amnesty for the “Arctic 30,” as his colleagues became known. They had to survive by the old Soviet mantra: “Don’t trust. Don’t fear. Don’t beg.” Willcox is a man of action, and his courage is clear, especially when fighting for such a voluntary cause. But a man without flaws makes for dull reading, and his epilogue fizzles. Far from exemplary as a memoir, but Willcox raises important environmental awareness and celebrates Greenpeace exploits, which should inspire like-minded activists.